Chomsky’s criticism of iterated learning experiments (see post here and here) is based on two points. First, the emergence of structure is more to do with the intelligence of the modern humans taking part in the experiment than a realistic language evolving scenario. He suggests that structure would not emerge in a series of computer programs without human intelligence. As as a colleague pointed out, however, the first iterated learning experiments used computational models of this kind. Secondly, he suggests that the view of evolution employed in the explanation of these systems is a pop-psychology, gradual hill-climbing one. In fact, Chomsky claims, evolution of traits such as language or eyes derive from single, frozen accidents. That is, evolution moves in leaps and bounds rather than small steps (Jim Hurford recently gave a lecture entitled ‘Reconciling linguistic jerks and biological creeps‘ on this topic). Why else would humans be the only species with language? Geoffrey Pullum counters this last point by asking why would an innately specified UG emerge so rapidly, but then freeze for tens of thousands of years, when (borrowing Phillip Lieberman’s point) traits such as lactose tolerance have emerged in the human genome within two thousand years. 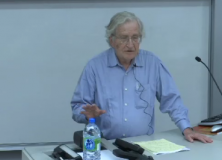 Chomsky gives some examples of traits that have developed rapidly, but then only changed marginally. I don’t think that proponents of iterated learning paradigms would have a problem with a sudden emergence of a capacity for advanced linguistic communication. Although there is a continuity between human and non-human communication systems, we have some tricks that other animals don’t (see Michael’s post here). However, the evolution of the structure of language after these mutations could owe a huge amount to processes of cultural transmission. The universals we see in the world’s languages, then would be an amplification of weak biological biases. However, Chomsky seems disillusioned with the whole field of what he calls ‘the evolution of communication’. At least we didn’t get it as bad as exemplar theory, which he dismisses as “so outlandish it’s not worth thinking about”. Regulatory gene: “for my next trick I shall turn an elephant into a fly, which will then go over and hover by a massive pile of dung”.